What Does It Take To Become A Security Guard? A career as a security guard can be very rewarding. You offer a specialized service that is second to none. Becoming a security guard requires skill, training and a license. If you’re thinking of working in the safety and protection field, the following will let you know what it takes to become a security guard. In order to be eligible for a security guard position in Canada, you must be a Canadian citizen. If you’re not a Canadian citizen, you will need a permanent residency permit or valid work visa. Depending on the province you wish to work as a security guard in, you will need to be at least 18 years old (19 in some provinces). Furthermore, if you are an active member of any police service with a peace officer status, you are not eligible to be a security guard. Finally, if you possess a criminal record, you will not be accepted into the security guard training program. 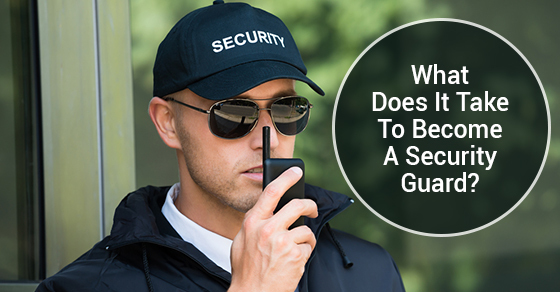 A variety of Canadian colleges, universities, and law enforcement schools have training programs available for those looking to start a career as a security guard. Some private security firms may have their own training programs but those are only used to prepare their own employees. The training programs will teach you how to remain calm in a crisis, assess danger, remain vigilant and spot potential threats. You will also be given first aid and safety training. Once you’ve completed the program you can move on to the exam portion. There is a security guard exam that you must pass. This multiple choice test has around 60 questions and you’ll have approximately two hours to complete it. The exam is administered by the Ministry of Community Safety and Correctional Services in each province. You only have to take the exam in the province you wish to work in. Once you’ve passed your exam, you’ll need a license. The Ministry of Community Safety and Correctional Services (the same place that issues the exam) is responsible for issuing security guard licenses. To apply for your license, you’ll need to present a passport-quality photo of yourself, proof of your completed training (you’ll be given a number to prove this), two pieces of valid ID and a filled-out guarantor info form. There is a market for security guards across the country. If you’re hoping to start your career in this field, contact us for more information.